For cars lovers and not only for them,Red Bull Kart Fighter is a racing game which will make you feel like a new Schummacher.he car you race as will follow a pre-determined racing line, with you controlling the speed of the car with a bar on the right side of your device. Or maybe you want to play Mafia Driver 2,another car online games from this genre.Avoid to crash otherwise the police will be called. Pass all levels to beat the game! 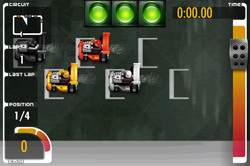 Street challenger is a car driving game where your goal is to hit all of the green cones on the city streets, to find them all look at the map in the upper left hand corner. Avoid hitting other vehicles otherwise you will damage your. Other racing games to try are King of Drift(you will take a part in a fast super car drifting race),Monster races-title says everything:is a race with big trucks.To beat other truck racers you must drive very fast and complete all 6 laps of the track as first. But there are also bike race games,for all ages and preferences.Bike Mania or Dirty bike are two of the well known games,where you are a motorcycle racer and you have to surmount all the obstacles as soon as you can. In conclusion,there are thousands of racing and cars online games.Choose what you want and have fun playing for free!